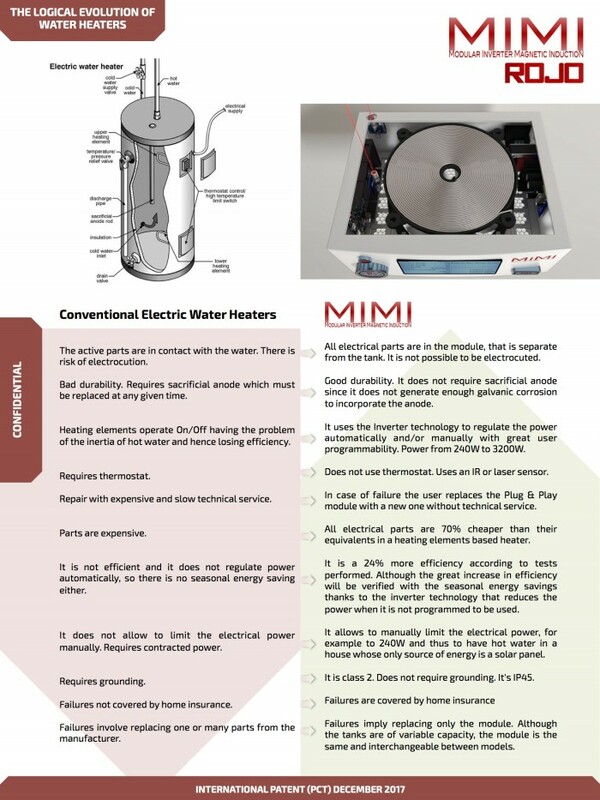 We own 2 patents in the field of household and industrial water heaters. 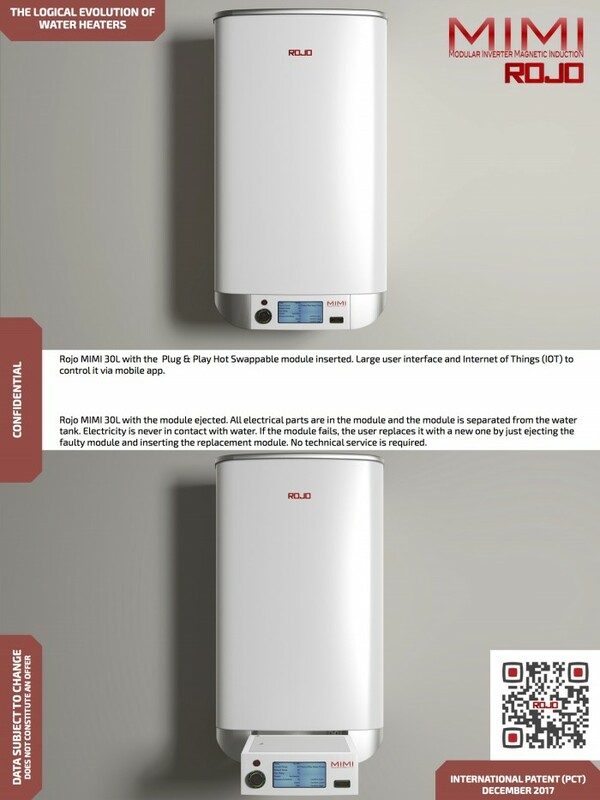 It solves all the problems associated with electric water heaters that are sold worldwide, adds new functionalities, greater energy savings and with a lower manufacturing cost. 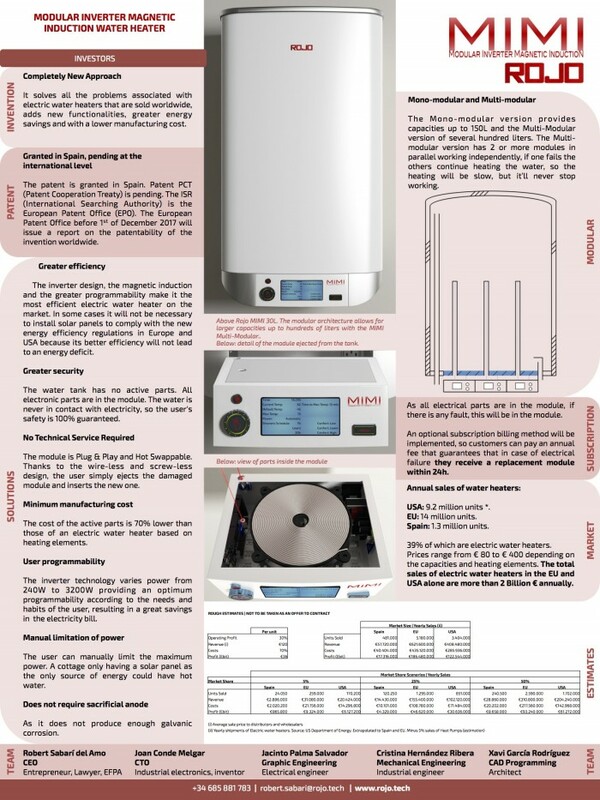 The inverter design, the magnetic induction and the greater programmability make it the most efficient electric water heater on the market. In some cases it will not be necessary to install solar panels to comply with the new energy efficiency regulations in Europe and USA because its better efficiency will not lead to an energy deficit. The water tank has no active parts. All electronic parts are in the module. The water is never in contact with electricity, so the user's safety is 100% guaranteed. The module is Plug & Play and Hot Swappable. Thanks to the wire-less and screw-less design, the user simply ejects the damaged module and inserts the new one. The cost of the active parts is 70% lower than those of an electric water heater based on heating elements. The inverter technology varies power from 240W to 3200W providing an optimum programmability according to the needs and habits of the user, resulting in a great savings in the electricity bill. The user can manually limit the maximum power. A cottage only having a solar panel as the only source of energy could have hot water. As it does not produce enough galvanic corrosion. The deposit can be made of any size and the Inverter Module and several inverter modules can be added being modular. We can send a brochure with further explanation. 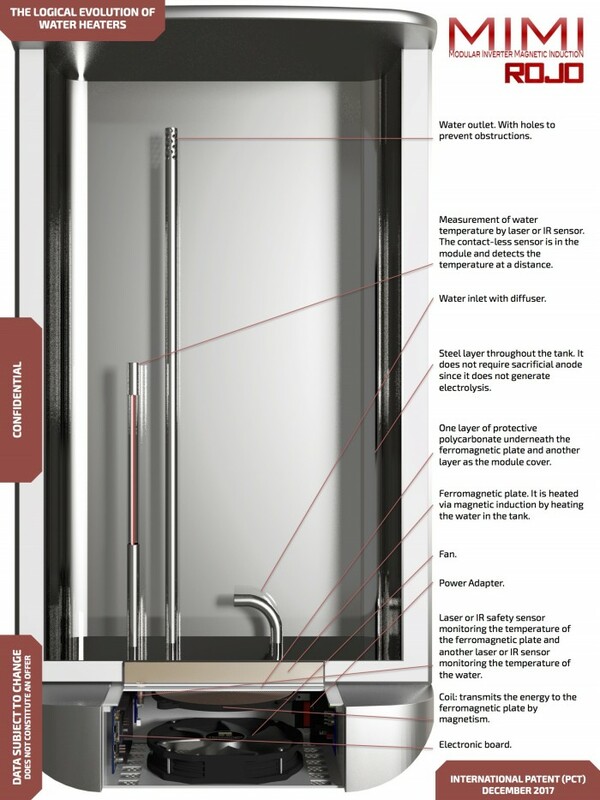 The Modular Inverter Magnetic Induction Water Heater aims to replace all current elements / resistors based water heaters in the world, making them obsolete. Page created at 2019-04-24 18:04:38, Patent Auction Time.